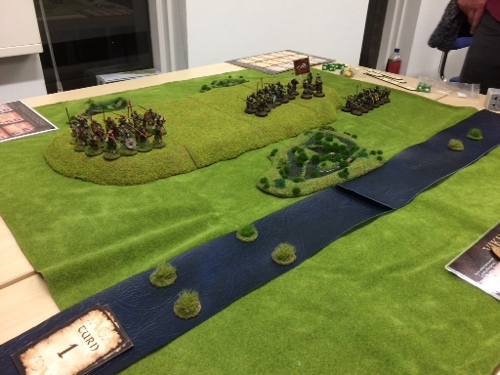 We played the first game of our 1066 mini campaign last night at the club. Morcar and Edwin formed their Shieldwall on a low hill in the marshes and confronted invading Vikings at Fulford Gate. Harald Hardrada and Tostig Godwinson deployed their warbands on the opposite side of Germany Beck. The Vikings found negotiating the fords somewhat challenging. 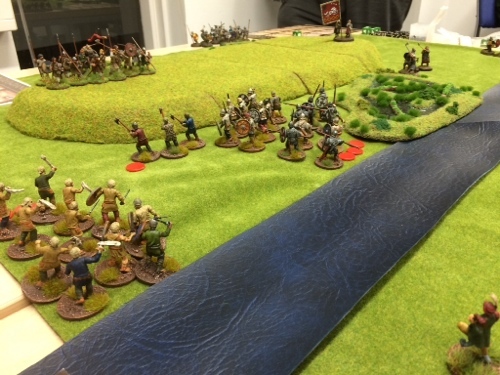 On the Anglo Danes left flank Tostig's forces approached the minor ford that was marshy but passable. Several skirmishes ensued with Edwin's warriors and the battle ebbed and flowed. But the Vikings had more men and eventually they managed to force their way across the ford. Meanwhile Harald organised his forces on the right flank and put his levy to the fore. As the tide receded, the levy waded across the ford but found themselves fatigued and intimidated. A potential disaster was unfolding as Harald found his warband trapped behind his fatigued levy. Morcar tried to take advantage of the situation and sent forward a small unit of warriors. The levy rallied themselves and held firm against the assault. Morcar's warriors were overconfident in their ability to defeat the Viking peasants and were greatly surprised when the levy scored the same number of casualties in the ensuing melee. Falling back, Morcar's warriors looked on as the levy pulled themselves out of the mud revealing Harald and his fully armoured Varengian Guard advancing behind. Tostig and his hirdman retainers trudged their way through the beck and found themselves facing Edwin's huscarls. Dane axes glittered in the afternoon light and when the cries of pain fell silent only the Anglo Danes remained standing. Tostig lay face down in the wet ground, his shield cloven. But the battle was not over. Seeing Harald's men start to pour through the larger ford, Morcar's huscarls ran to meet the challenge. But they were cut down to a man by a rampaging group of Viking berserkers. The situation was now looking very bleak for the Anglo Dane Shieldwall. Viking warriors charged up the hill and with cries of Valhalla they fell upon the Anglo Danes. When the air had cleared, the Vikings were dead. But out of a 12 man unit of Anglo Dane warriors only three men remained standing. The fear of Loki overcame the Anglo Danes and they fled the field leaving Morcar stood alone. With grim determination Harald and his Varengian Guard set upon Morcar and cut him down. Pausing for breath Harald looked across the hill towards York. Was the city now within his grasp? But Edwin and his huscarls stood firm. Charging forwards the Anglo Danes threw themselves at the Viking King. Staggering back, Harald was forced to defend himself but to no avail as Dane axes hacked at his armour. 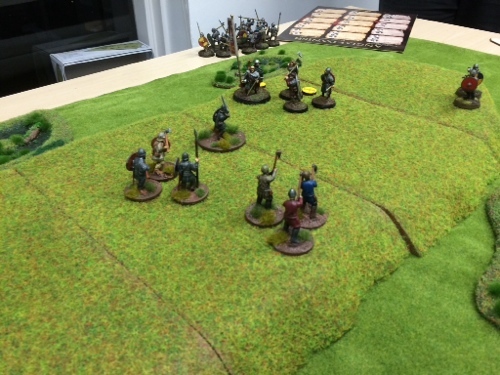 Seeing the danger his guards threw themselves forwards and three fell defending their lord. As the light of the day faded, Tostig's men started to scramble up the hill. For the Anglo Danes, the battle was lost. Edwin and what remained of his huscarls retreated across secret paths through the marsh towards York. We had a blast playing this game and it was surprising how such a small force could hold up so well. The tides made a real difference to the game and the Vikings nearly had a disaster when their levy clogged the larger ford. If I had used Lords of Battle the fatigue would have completely stopped Harald's advance. But I kept the dice on my board expecting the levy to be pushed back. Oops! Once Harald and the rest of his men had made a bridgehead the end was inevitable. The Vikings scored 28 slaughtering points + 4 points for units on the hill. 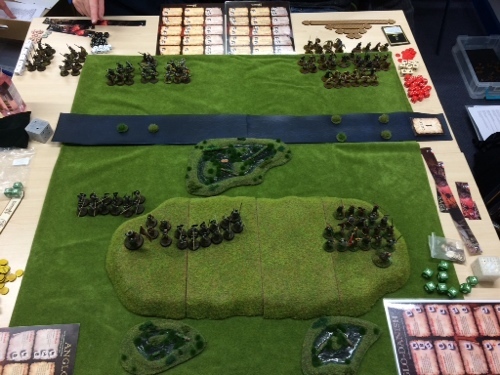 The Anglo Danes scored 26 slaughtering points + 2 points for Edwin and his huscarls on the hill. Since Tostig had fallen and Edwin remained alive, the Vikings scored a Minor Victory. The only change we made to the previously published scenario was to define the ford widths as S for the major ford and VS for the minor ford. Great game and big thanks to Rob, David and Dan for the mayhem! Great AAR, looks like the scenario played our realy well! I look forward to the next battle! Cheers, it was a most enjoyable game. I've tidied the post up a bit now to make it easier to read btw. I wrote it using an app on my iPad and it doesn't deal with line breaks very well. Lee, try an app called Blog Touch Pro - very good. Thanks Norm, alas it only works on ios 8 and my old ipad is still on 7. Perhaps I need to upgrade! Sounds like a close-run battle!